One hallmark of a true artist is being able to create beauty out of anything. While certain artists might have preferences for one medium over another, there are some that never go out of style. Clay is definitely one of these, and paint is another. Metal statues and sculptures have also always had a place in traditional art. Recently, stainless steel has grown in popularity. Artists have crafted a number of impressive pieces in this material. How Does Stainless Steel Become Art? Art can be anything, or come from anywhere, and stainless steel is no exception to that rule. By its very nature, stainless steel offers a level of durability and versatility that is hard to find. Because there are so many options for finishes, it’s possible to create all kinds of art, ranging from the Dublin Spire to Balloon Dog. Polishing a piece to a bright gloss, also called a mirror finish, can take days or weeks. As a result, it will help the piece last for a long time. Both Balloon Dog and Chicago’s Cloud Gate make use of mirror finishes. The original Balloon Dog is also an excellent example of the finishing technique for a drastically different color effect. An artist has many options when using stainless steel, making it a popular choice for sculptures and statues around the world. 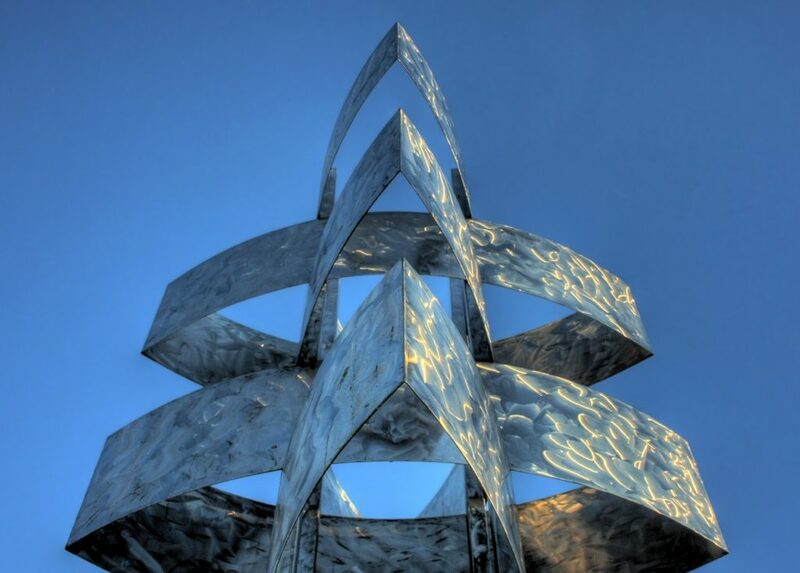 How Does Stainless Steel Art Benefit a City? The method of finishing a stainless steel piece can ensure its durability and longevity to a remarkable degree. Even if an artist decides to go the route of steel brushing, sandblasting, or heat treatments, the piece will still be sturdier than one made of marble or clay. A paint finish would bubble and peel. Fortunately, with the variety of options available for stainless steel, a paint finish is not necessary at all. Given that stainless steel can be manufactured in several different shapes and sizes, and easily joined together, this also makes it a more cost-efficient alternative. A larger piece needs to be lugged around as one solid whole. Or, it can be carefully taken apart and reconstructed on site. This could leave noticeable marks behind. Many praise stainless steel for its reshaping abilities. With a little grinding and sanding after the welding, the piece will look like one finished whole. Where Can I Find Stainless Steel Art? There are stainless steel pieces everywhere. From The Seed Sculpture in Manchester to the Sibelius Monument in Finland, creative works by creative artists are everywhere you go. Depending on the artist, different techniques will come into play. Depending on the location, different grades of steel come into use. For example, the Cones in Canberra, Australia might require a higher grade of steel than Turning the World Upside Down in Jerusalem. The Cones are a little closer to nature, and therefore more likely to deal with damaging elements. While pieces like News might have run at the forefront of the longer lasting steel sculpture trend, the evolution of the steel industry, and what we can do with it, has given rise to several alloys. Each of these is much more resistant to corrosion than the last. As a sculpture trend, stainless steel is here to stay — and stay beautiful. It’s been a game changer from its earliest appearances, focusing on outlasting the environment, to the newer pieces that take advantage of modern technology.